Maybe you, too, fall into this trap from time to time. I know very well on an intellectual level that profound change comes not in tectonic shifts of the earth’s crust, but more from the slight tremor inside a seed. In our fast food, microwave and instant-messaging world I still drag my feet, but selfishly expect the glacial pace of profound change to quicken where my dreams are concerned. In the past few years a few outstanding books have inspired me. Some redefined my perspective on business and finance; others transformed my psychological, even spiritual beliefs. The Power of Now, Eckhart Tolle, and Napoleon Hill’s Think and Grow Rich are classics that shift foundations. Recently, I read The Slight Edge by author Jeff Olson. In comparison to the classics, The Slight Edge is a coloring book. However, I couldn’t pay it a deeper compliment, or greater respect. In essence, the book puts into layman’s terms the concept of compounding — a phenomenon Albert Einstein called “the most powerful force in the universe, or the 8th wonder of the world.” Ask any self-made millionaire and they will praise the juggernaut of compounding, but seek the confession of anyone with a mortgage and they’ll say it’s a scourge. The Slight Edge it’s not about money but rather the principle of how actions taken everyday unilaterally compound into prosperous realities, or regurgitate pitiful results. If you have ever had a twinge of cynicism over the desperate routines of lottery junkies, the truth is we are not so far removed. Not when we buy into our dreams only to set them on a shelf and wait for one profound intervention to transform our lot in life. We say silently to ourselves, someday…. someday I’ll travel, someday I’ll… The justifications usually come down to not enough money, or this is not the right time. True, maybe, but justification enlists permission to abdicate responsibility and to do nothing. The task is too daunting for today. So today becomes tomorrow, and tomorrow becomes someday — the eighth day of the week. 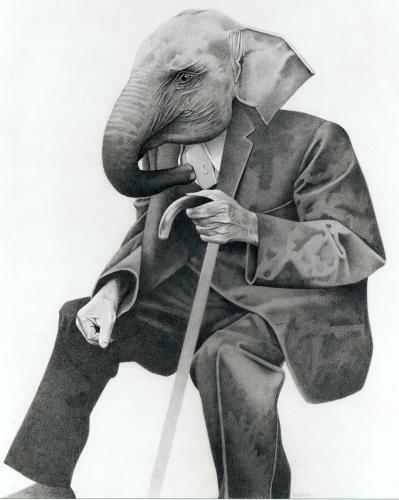 The thing desired becomes the elephant that can’t be eating in one bite, so it is abandoned undone. The Slight Edge eschews everything-or-nothing attitudes in favour of small efforts compounded daily. Tiny tasks done consistently that move towards a goal…one bite compounded over time will consume even an elephant. Intellectually, these are simple concepts. Dreams aren’t seeds that grow from strikes of lightening, rather from insignificant but incessant rain drops that swell into streams, become rivers and flood the plains where seeds of our desires are planted. PS, No real elephants were eaten in the writing of this blog. that was good eating. well done. You’re a good egg Mr. Cruz! Thanks my friend. Love your profound words and style of writing. Have read first 2 books and will now tackle in small bites the 3rd! Thank you for sharing. Thanks for the kind words Sharon. I’ve said it before and I’ll said it again and again and again…you have a graceful, thoughtful, provocative, generous writing style which I admire and aspire to develop in my own prose. Thank you for sharing these pearls of wisdom. I also read your article “Greatest Gift”. I see myself and my recent experiences in your thoughts and words. Enlightening and so true – our greatest gift is our freedom to choose. Thanks for sharing your thoughts and insights! Making be blush is not a task done lightly. I’m glad to have my words do good. “Dreams aren’t seeds that grow from strikes of lightening, rather from insignificant but incessant rain drops that swell into streams, become rivers and flood the plains where seeds of our desires are planted.” My favourite phrase! Beautifully written. So talented Chris! Thank you SuperChan; it means a lot.